When i was a kid on Long Island we used to go to the stock car races at the Freeport Speedway every 4th of July for a good part of the ’70s. It was a lot of fun, we used to watch the smash-up derbies, the full-blown car races on a 1/5 mile track, that was pretty fast and furious. I have fond memories of the Freeport Speedway, and in 1983 in closed it’s doors for good, and sat idle for almost a decade before it was bulldozed and became—what else?—a box store. A treasure of a track and a relic of the 50s that in many ways was a home for the custom car culture of that era—the DIY community that represented the industrial equivalent of our hacking culture now. So, this next toy is extra special to me, because what I associate it with more than anything is the Freeport Raceway, and the look on my mother’s face during the demolition derby—there was a genuine feeling of excitement and the small time nature of it made the whole thing that much more visceral. I still carry with me the image of us on those bleachers listening to the buckling metal and the wailing engines digging in for another joust. There is something liberating in watching things smash apart. 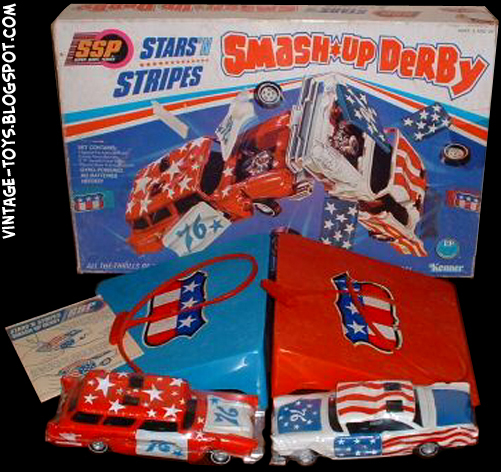 And Kenner’s SSP Smash-Up Derby toy was the realization of a 6 year old kid’s idea of America’s 200th birthday. I mean I so closely associated the 4th of July with the Freeport Raceway, and it just made sense that there was a Spirit of ’76 themed Smash-Up Derby set, what cold make more sense? 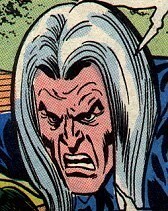 But more than that, this was a bitching toy. You got two American flag-themed, ripcord-driven cars, along with two sturdy ramps. My brother and me would line up on either side of our living room and crash these suckers for hours. It was a blast, and as the commercial below suggests, they really did crack up. This is not the fake crack of today’s toys whee an open hood and slightly ajar door conservatively approximates a crash, this was broken axles, missing wheels, amputated doors—the real horror show you expect from a head on collision. This toy will always be indelibly linked with the lost legacy of the Freeport Speedway, as well as the smiling excitement that place seemed to animate in my mom. This entry was posted in 1102xmaS and tagged 1102xmaS, kenner, SSP Smash-up Derby, toys. Bookmark the permalink.